Rain is the absolute enemy of a bird ringer. Rain means the nets stay closed, maybe some extra sleep, and sitting inside watching the radar images, awaiting the eventual break in the clouds. Today was a rainy morning, which still means waking at 4am with your alarm, but the next few hours are somewhat in limbo. Stay in bed or get dressed? Have breakfast or wait? Go to the nets in the hope that it has stopped when you get there? Limbo carries until either the rain stops, or it’s effectively too late to open the nets. A morning spent away from the nets is not a waste. It gives a trainee like me the chance to review and consolidate some of the information gained over the last few days. I can have a close look at some photos, examine books, and try to prepare myself for what may arrive in the nets tomorrow. 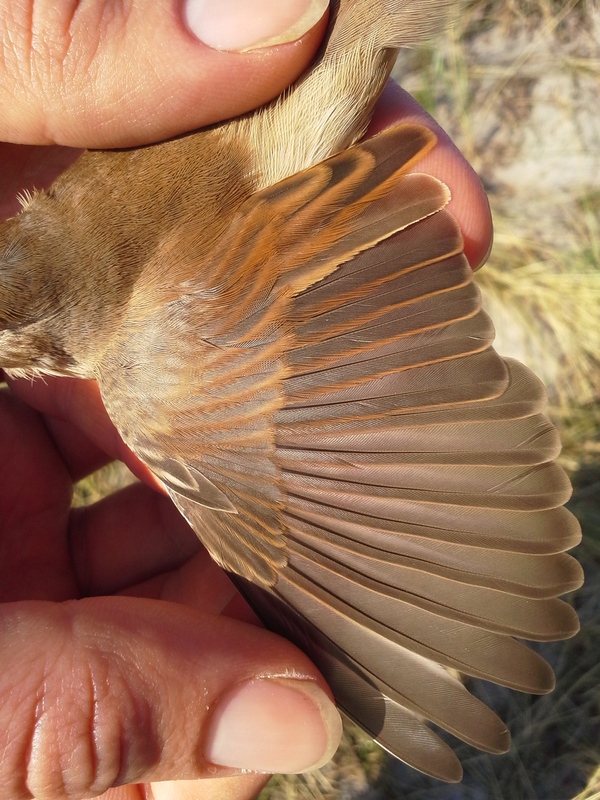 This is a photo of the wing of an adult Common Whitethroat (Sylvia communis). If you look carefully you can see one feather that looks different in the wing (close to the body of the bird). By carefully examining the feathers on every bird, we can collect information about the stage of moult (or feather change). Here we can see the bird has moulted or changed all of the long feathers in the wing (primaries and secondaries) except for one. In the picture you can see it is paler in colour (especially around the edge of the feather) and appears worn, not fresh, glossy and “new” like the other feathers around it. This information helps us determine the age of the bird and understand more about it’s life in general. Read more about Sylvia communis here. Rainy days are interesting days too!